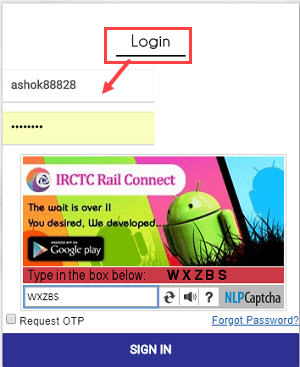 IRCTC users can change registered mobile number very easily by login their account. Here is step by step guide on how to register new number on IRCTC account. IRCTC (Indian Railway Catering and Tourism Corporation) is an official Indian railway website to book train tickets online. IRCTC handles catering, tourism and online ticketing operations of the Indian railways. Please use Microsoft Edge Browser to access the IRCTC website without any error and glitches. Enter your Username and login password, type CAPTCHA code and click on login. Step 2: After login, click on MY ACCOUNT — My Profile and then click & open Update Profile as you can see below screenshot. Step 3: In the profile section, you can see your current registered mobile number. To change/register, click on the Edit button. Step 4: Now enter your new mobile number. Make sure ISD code should be (91). After entering the new number just click anywhere on the screen. Step 5: The pop-up box will ask you to confirm your request. Click on ok.
You will receive One Time Password on your new mobile number. Done! your mobile number is successfully updated with the new number. Please note, after changing your current mobile number, you can again update or change it after 24 hours. In mobile number changing process, you don’t need the old mobile number so you can update your mobile number with a new one anytime. So this is how IRCTC users can change or update registered mobile number for their account.